Once you have an instructor account in Lumen OHM, here are some first steps to help you get a course set up so you can start teaching. In order to create a new course, you'll need to click on the "Add New Course" button from the home page of your instructor account. On the new course page, you will need to enter your desired course name and the enrollment key. Your enrollment key will be used if you have students enroll themselves in your course (rather than you enrolling them). Make note of the course ID (generated after you submit the course settings) and Enrollment Key so you can pass this information along to your students. If you are using LTI through an LMS to link to Lumen OHM, you don't need to worry about a key, the LMS will verify each student's identity. Do you want the material available to students right now? This allows you to hide the content from students at the end of the course. Start with blank course. Selecting this option does not mean you can't ever bring in already created content—it simply starts you with an empty shell. Once you have selected the course you want as a template, click Submit, and your course will be auto-populated with the entire template course. It is recommended that you start with a template course to learn about all of the features in Lumen OHM. You may also want to bring in portions of content from different courses. Once you have created your course (either as a blank course or as a template course), you'll click on Enter the Course. This is your course's page. In the left-hand menu, you'll find a section called Course Items. 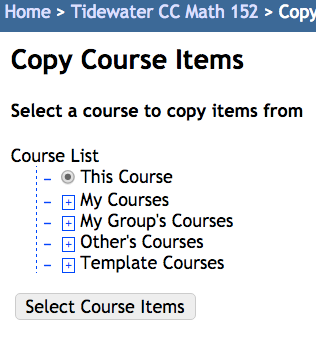 You can bring in items from other courses by clicking on Copy (you'll be copying items from the courses). All public courses are available to preview from this Copy Course Items page. You can only copy other courses that do not have an enrollment key set. You will be taken to a page with the following choices from which to copy content. For each of these choices you can either copy the whole course of individual items. My Courses - you will be given a list of your courses to choose from. My Group's courses - everyone who requests an instructor account from the same institution are placed into the same group - you will see a list of the other faculty with instructor accounts at your institution. This is a great way to share template courses amongst entire departments. Other's Courses - here is a huge list of other instructors using Lumen OHM. Remember, you can only copy other courses that do not have an enrollment key set. Template Courses - you can choose from our list of template courses. Once you have selected a course, click Select Course Items at the bottom of the page. From this page, you can then select to copy the entire course or you can select specific items. Blocks have a colored header. If a block is displayed collapsed, click the block name or the expand arrow to view the block's contents. If the block is displayed as a folder (has a folder icon next to it), click the block name to view the block items. Text items are preceded with an information yellow sticky note icon, forums are preceded with a F icon, and assessments are preceded with a pencil and lined paper icon. The icons will be grey when the item is not available, and (depending upon install settings) may change color as a deadline approaches. The color is green at two weeks, yellow at one week, and red on due date. The item order can be rearranged by using the number selector to the left of the item. Items can also be moved into or out of blocks using this selector. Add an item by selecting the item type from the "Add Item" pulldown. Using the "Add Item" pulldown inside a block will add the item to that block. When not available: Whether you want to hide the block from students when not available, or show collapsed or as folder (depending on available setting). Use the show collapsed/folder option if the block contains items that students still need to be able to access. Files: You can attach one or more files to an inline text item. For each file, provide a description of the file. A list of the descriptions, with links to the files, will display at the bottom of your text item. Group linked: If you have a group assessment, you can link the forum to the groups of that assessment. If you do this, students viewing the forum will only see posts from their group members and instructors. Be aware that posts to group linked forums often won't trigger the red "New Posts" flag on the home page. Students can reply by: Optionally set date restrictions for students replying to posts. Can be overridden in individual threads. Count in gradebook: Whether you want the forum to count in the gradebook for points. You will be able to assign points for individual posts made. Gradebook category: Category for the gradebook, if assigning points to the forum. You can add existing questions to an assessment by clicking the "Select Library" button to choose libraries to search, then the "Search" button to list potential questions. Leave the "Search" entry blank to list all questions in the libraries selected. The checkboxes can be used to search in all libraries (not just the selected ones), list only questions you own, or exclude questions you've already added to your assessment. Use the checkboxes to select questions, then click the "Add Selected (using defaults)" button to add the questions. Adding this way will use the assessment default settings for points, attempts allowed, and penalty per attempt. You can change these later by clicking the "Change Settings" link. Use the checkboxes to select questions, then click the "Add" button to add the questions. Adding this way will allow you to override the default settings for points, attempts allowed, and penalty per attempt if you wish, and add a question multiple times. Alternatively, you can click the "Select from Assessments" button to choose questions from existing assessments. In this mode, select the assessments you wish to pull questions from and click "Use these assessments". Then select the questions you wish to use. Remove from assessment: Remove the question from the assessment. This does not delete the question from the Question Set. You can also use the checkboxes and the "With selected, Remove" button to remove multiple questions at once. Would you rather watch the video? Here's a link to some instructional videos on these topics.